Last week, the NASA DC-8flew three flights over the California Central Valley to test the performanceof a laser-based instrument designed to measure methane in Earth’s atmosphere. The Methane Sounder Instrument, built by Haris Riris and histeam from the Goddard Space Flight Center, may one day map methane from afuture Earth or Mars orbiting satellite. On Earth, methane is animportant greenhouse gas produced by certain types of bacteria in soils and inthe digestive tracts of some animals. Large quantities of methane are alsoproduced as a result of forest fires and human industrial processes. Knowledge of the global distributionand abundance of methane is important for understanding global climatechange. Methane has also been recentlydetected on Mars. Because methaneis rapidly destroyed in Mars’ atmosphere, it must have been produced relativelyrecently. While geologicalprocesses can produce methane, another exciting possibility is that Mars’ methane isproduced by life. Determining the abundance and locations of methane sources onMars is therefore extremely important for understanding recent geological (andperhaps biological) processes occurring on the Red Planet. 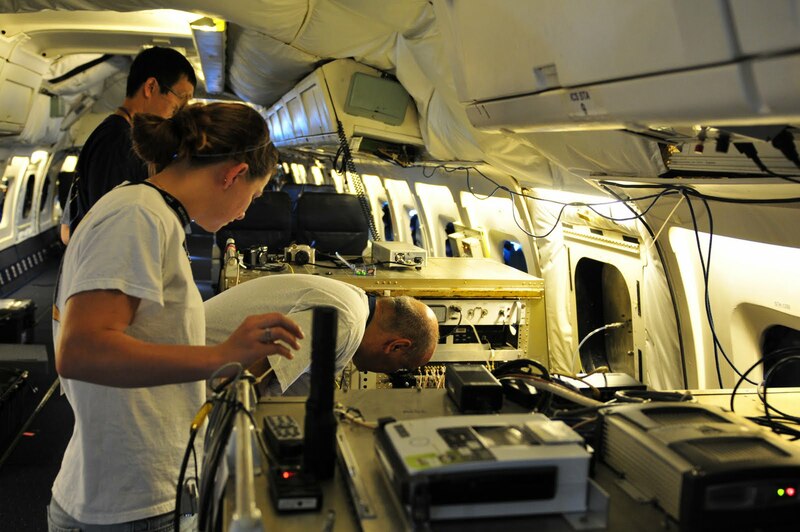 Before instruments areinstalled on satellites or spacecraft, many are first tested from NASAairplanes. 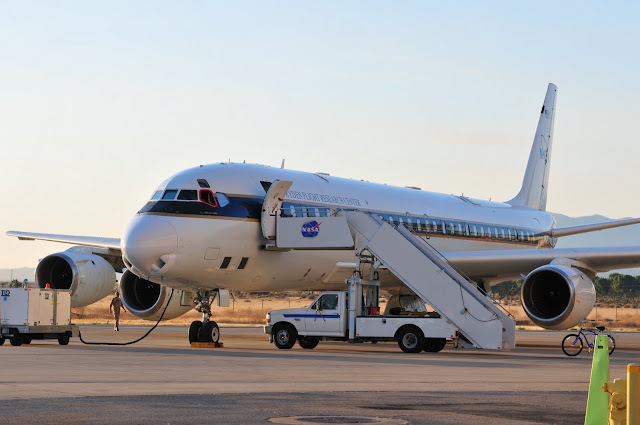 The Methane Sounder instrument team spent two weeks at the Dryden Aircraft Operations Facility inPalmdale, CA installing and testing their instrument on the NASA DC-8. 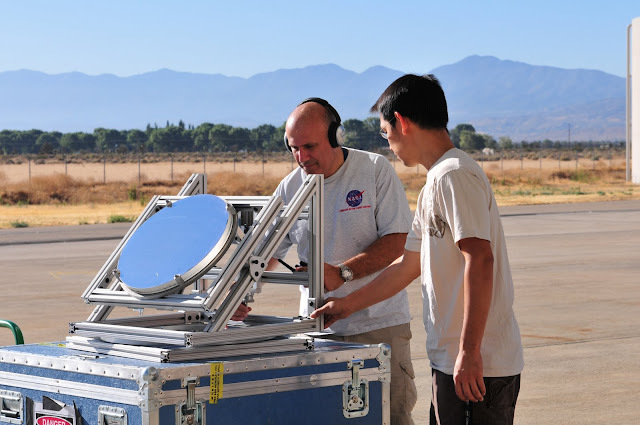 They spent several days aligning andtesting the instrument from the airplane on the ground before finally testingits performance on three flights over the California Central Valley. Methane Sounder instrument PI Haris Riris (left) and StewartWu (right) test the alignment of the laser underneath the DC-8 at the NASADryden Aircraft Operations Facility. Before flying their instrument on the DC-8, they fired its laser fromthe parked airplane toward the ground, reflected the laser off of a mirrorunderneath the airplane (above), and aimed at a nearby building. The infrared laser is invisible to thehuman eye. 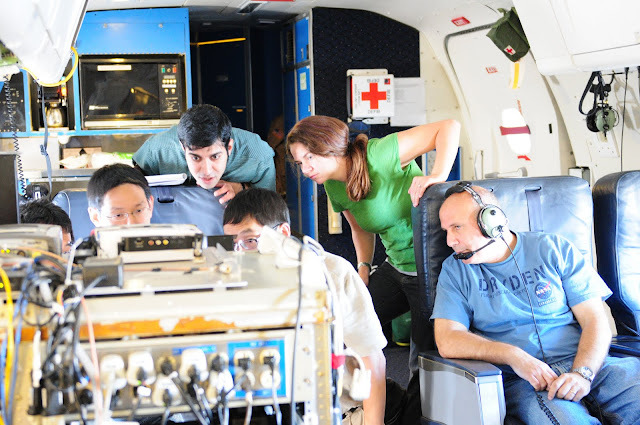 Inside the DC-8, while parked at the Dryden AircraftOperations Facility, Haris Riris (center) and Martha Dawsey (left) align thelaser for the Methane Sounder instrument. The laser is fired straight down through a port on the underside of theaircraft. To test the alignment,it was reflected off of a mirror (see above) and then off of the side of a nearlybuilding. The Methane Sounder Instrumentdetects methane with an infrared laser beam. The laser emits light at a wavelength (color) that is toored for the human eye to detect (1.65 microns). Thiswavelength corresponds to one of the wavelengths that the methane moleculeabsorbs light. As the laser passes through the atmosphere and bounces off of theground, methane molecules in the atmosphere absorb some of the light from thelaser. Measuring the amount of absorption that occurs as the instrument passesover different locations allows the team to build methane maps. Although current Earth-orbitingsatellites have instruments that can detect and map Earth’s methane, the laser-basedsystem of the Methane Sounder will enable much higher accuracy methanedetections and higher resolution methane maps than are possible with currentnon-laser based instruments. With somemodifications, the laser system could also be used for a Mars-orbiting satellite. The NASA DC-8 early morning before takeoff for the MethaneSounder Instrument test flight on August 24, 2011. To test the instrument, theteam flew at a variety of altitudes over a large methane source (a cattlefeedlot) in the California Central Valley. Flight track (in red) for August 24, 2011. The DC-8 took off from Palmdale,California, flew northwest to the California Central Valley and flew in a largeracetrack pattern around a cattle feedlot. Altitude profile of the DC-8 from August 24, 2011. 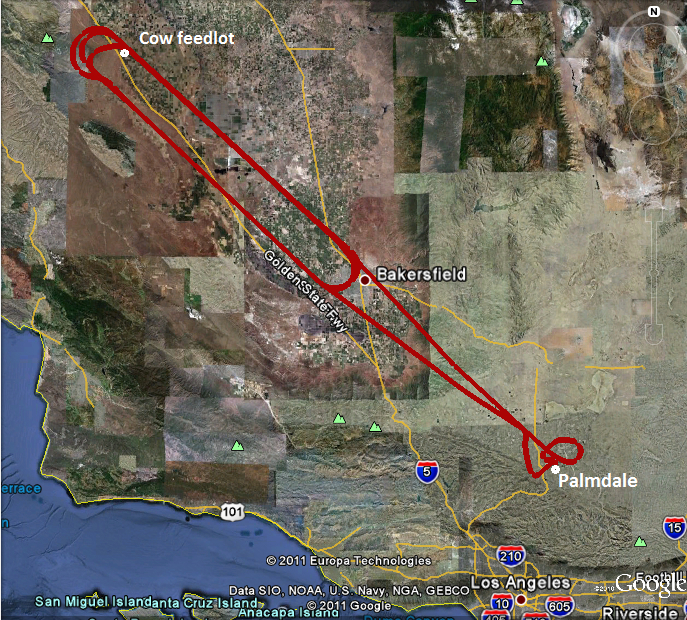 The DC-8 took off from Palmdale, flewat 10,000 feet toward the cattle feedlot and then increased in altitude in 5000-footincrements while flying in a racetrack pattern over the California CentralValley (see flight track map above). Haris Riris (right) and his group from the Goddard SpaceFlight Center watch as they acquire data with the Methane Sounder Instrument onboardthe NASA DC-8. 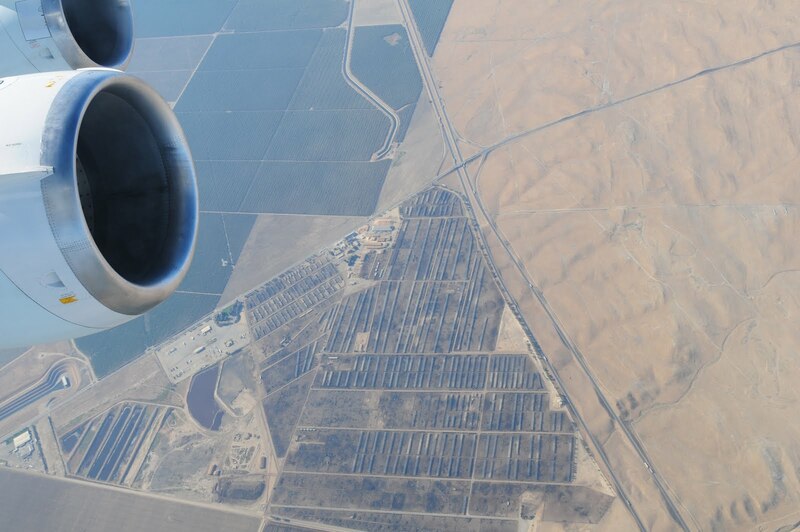 Cattle feedlot near Coalinga, Central California seen from10,000 ft from the NASA DC-8. Dueto the large number of cattle concentrated in such a small area, this feedlotis a large methane source. 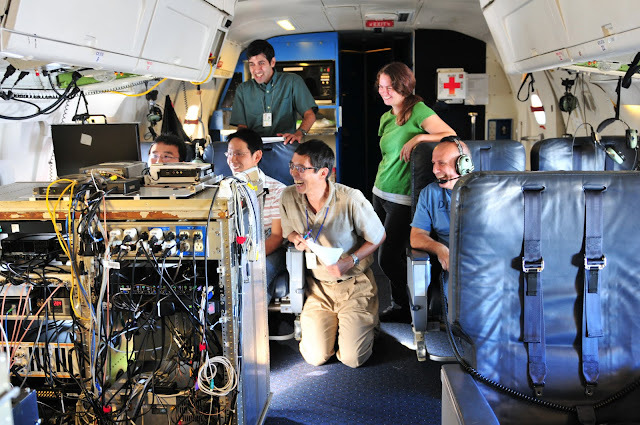 The Methane Sounder instrument team is all smiles in flightonboard the DC-8 as their instrument performs well. Funding for the MethaneSounder was provided by the NASA Astrobiology Science and Technology forInstrument Development program with support from the ASCENDS CO2 Instrument Incubator Program.